Chemical and biological warfare had been practiced long before the 20th century, albeit in primitive forms. Poisoning wells with carcasses and using smoke to drive opponents out of cover were not new concepts. However, chemical warfare took a deadly modern turn during the First World War, when the chemical industries of the belligerent powers produced increasingly deadly poison gases for use on the battlefield. Chemical Warfare. In 1899, the Hague Declaration Concerning Asphyxiating Gases banned "the use of projectiles, the sole object of which is the diffusion of asphyxiating or deleterious gases." However, during the First World War, the Germans took the position that shells that contained both high explosive and poison gas were not banned, since the gas delivery was not their "sole" object. The Germans also decided that delivering gas from storage cylinders was legal, since these were not projectiles. The Allies responded in kind. The first poison gases were choking gases like chlorine or chlorine-derived phosgene that destroy the lining of the throat and lungs. These are toxic, but were only moderately effective as weapons, because they cause damage only when inhaled, dissipate quickly, are easily detected, and can be protected against with relatively simple masks. The same was largely true of the so-called blood gases, which included hydrogen cyanide and its derivatives. Cyanide is very toxic when inhaled but dissipates very quickly. The next generation of chemical weapons, which came into battlefield use as the war was winding down, were vesicants or blistering agents, such as mustard and Lewisite. These were much more effective as weapons. They are oily liquids, which take some time to dissipate (days in the case of mustard); they can blister unprotected skin, so a gas mask is not sufficient protection; and they tend to disable rather than kill -- which, paradoxically enough, is often advantageous in warfare. The Versailles Treaty absolutely prohibited any production or stockpiling of chemical agents by Germany. During the 1920s, chemical agents came to be viewed as uniquely horrible weapons, and the 1925 Protocol on the Prohibition of the Use in War of Asphyxiating, Poisonous or Other Gases, and of Bacteriological Methods of Warfare (known as the Geneva Protocol) was ratified by many nations. Curiously, the United States did not ratify this protocol until the 1970s, although they largely respected its prohibitions. The Geneva Protocol banned the use of chemical and biological weapons in warfare, but not their production and stockpiling. Most industrially advanced nations maintained stockpiles as a deterrent against use of these weapons by other powers. In November 1936, German insecticide researchers at I.G. Farbin synthesized an organophosphate compound that proved to be highly toxic to both insects and mammals. This compound, Tabun, was much too dangerous for use as an insecticide, but the German armed forces quickly recognized its potential as a chemical warfare agent. Tabun was the first of a third generation of chemical weapons, nerve agents, which act by destroying the body's ability to turn off nerve impulses. Nerve agents are extraordinarily toxic and tend to kill rather than disable. Like mustard, they are oily liquids that take some time to dissipate, and they can penetrate unprotected skin. However, Tabun is unstable and has a distinctive odor. In late 1938 the German researchers discovered Sarin, which is considerably more toxic than Tabun, more stable, and has almost no odor when purified. By spring of 1942 the Germans had put Tabun into mass production and were working on production facilities for Sarin. Production was limited by supplies of raw materials, such as phosphorus, which the Germans obtained from phosphate deposits in North Africa. These sources became unavailable to the Germans as the result of Operation TORCH, and production fell far short of goals. The Germans also discovered Soman in the spring of 1944. Soman is twice as toxic as Sarin and acts very quickly, so that antidotes such as atropine are difficult to administer in time to save the victim. Neither Sarin nor Soman were stockpiled in significant quantities. British researchers at the University of Cambridge apparently discovered nerve agents in 1941, but the British discovery, DFP, was not much more toxic than mustard and so was not stockpiled. However, In one of the most fortunate intelligence failures of the war, the Germans underestimated their own lead in nerve agents and never used chemical weapons during the Second World War, fearing a devastating retaliatory response. For example, Hitler ordered a nerve gas attack on the Russians, to take place on 20 April 1943, that was subsequently called off. Hitler also called for the use of chemical agents in the V-2 ballistic missile, but the limited warhead capacity of the V-2 meant that not enough agent would survive the fiery impact of the missile to do more damage than a conventional explosive warhead would inflict. Japan built up extensive stockpiles of mustard and other first- and second-generation chemical agents, and there remains little doubt now among historians that they made use of them against the Chinese, who had no means of retaliation. The precise extent and effectiveness of Japanese chemical attacks remains controversial. One source (Japan Times) claims that 2000 attacks took place, killing 10,000 persons. Drea (2009) claims that poison gas ("special smoke") was used during the Hankow campaign of August 1938. Allen (1984) quotes a credible report from a Japanese source that the Japanese, lacking more conventional antitank weapons, made very limited use of cyanide grenades (chibi-dan, "tick bombs") against British tanks in the vicious fighting northeast of Imphal. The evidence for Japanese use of chemical agents in China is summarized by Tanaka (1988). The Americans were privy to British research on nerve agents, but none of the roughly two hundred organophosphates screened by American chemists were significantly more toxic than DFP, which the Americans called PF-3. A pilot plant was built to produce PF-3, but only 535 pounds were produced and PF-3 never went into the stockpile. Instead, American chemists focused on insecticides like DDT that could be used to control malaria-transmitting mosquitoes, and the American chemical weapons stockpile was based largely on mustard. Another class of chemical agents are the tear gases. Compounds such as bromoacetone were discovered before the First World War and saw some use as chemical agents during that conflict. Tear gases irritate the eyes and upper respiratory tract, but do lasting harm only under unusual conditions. Because of their nonlethality, they are useful for riot control, and their use in warfare was not explicitly banned until 1997. With one exception, there is no evidence that any of the Allies used chemical or biological agents, either in Europe or the Pacific. However, during the 1943 Italian campaign, the Americans feared that Germany might be on the brink of using chemical agents in Italy, based on prisoner of war interrogations and intelligence passed on by the Italians. On the night of 2 December 1943, a German air raid on the Italian port of Brisi sank several ships, including an American ship loaded with mustard shells that were being deployed for possible retaliatory use. The raid was highly destructive and it was difficult to determine how many of the casualties were from mustard released into the harbor, but mustard casualties likely numbered in the hundreds. The exception was the use of tear gas during the mopping up of Iwo Jima in May 1945. The Americans had considered using mustard gas during the battle, but eventually decided against it, a decision Nimitz later expressed regret over. However, Hastings (2007) claims that the Americans unsuccessfully tried using tear gas to drive survivors of the battle out of the extensive underground fortifications on the island. When this failed, the survivors were burned out using a mixture of salt water, gasoline, and oil. Towards the end of the war, the U.S. Strategic Bombing Survey recommended to the Joint Target Group that a new herbicidal chemical, TN8, be used against the Japanese rice crop. This recommendation was rejected with the terse observation that "indigenous food supplies may be very important to the commander charged with the occupation." TN8 would not have been ready before 1946 in any case. The Army Air Force and Chemical Warfare Service also studied the use of poison gas in the bombing campaign, but none were ever used. Biological Warfare. Biological warfare is viewed with even more repugnance than chemical warfare, in part because of the possibility that the use of biological weapons could lead to a pandemic. Biological weapons did not see use in the First World War, but they were investigated by several of the major powers during the Second World War. To be effective in warfare, a biological agent must be virulent, but not so virulent that it easily spreads to friendly troops. Furthermore, there must be a way to deliver the agent and the agent must be resistant to countermeasures. One of the biological agents investigated by several nations during the Pacific War was anthrax, which is contracted when the spores are inhaled and carried to the lymph nodes of the chest, where they begin to proliferate. Anthrax is an almost ideal biological warfare agent. Inhalation anthrax is almost 100% fatal and can be contracted from minute traces of the properly aerosolized agent, but it does not easily spread from person to person, so there is no danger of a pandemic. Once symptoms are noticed -- up to several weeks after the exposure -- the victim is usually beyond aid. However, the disease can be successfully treated with antibiotics if detected early. Like anthrax, plague has a high lethality, but the normal form of the disease (bubonic plague) is transmitted via infected fleas, which the Japanese found difficult to accomplish artificially. However, if plague spreads into the lungs of its victims, the resulting pneumonic plague (thought to be the cause of the Black Death of the 14th century) is easily spread from person to person. In this form, there is real danger of a pandemic. Like anthrax, plague can be controlled with antibiotics. Cholera is transmitted through contaminated water. The cholera bacteria multiply in the intestines, where they produces a toxin that causes severe and often fatal diarrhea. The difficulty with cholera as a biological warfare agent is in getting the bacteria into the enemy's water supply in sufficient concentrations to cause the disease. Ordinary public health measures are highly effective in controlling cholera (the disease having played a prominent role in the historical development of public health science) but these were lacking in China, where the Japanese are thought to have experimented with the use of this agent. The Japanese conducted extensive experiments in biological warfare in Manchuria under the auspices of Unit 731. Plague, cholera, and anthrax were all investigated, and it is though that the Japanese attempted to trigger a plague epidemic in China using a "flea bomb" to transmit the agent. It is unclear whether the campaign had any effect: Plague is endemic to China and cases reported at the time may have had nothing to do with the "flea bombs." Hastings (2011) claims the Japanese attempted to ship "flea bombs" to Saipan to use against the Americans, but the ship carrying the bombs was sunk en route. One can speculate that, had the Americans discovered proof of the Japanese plans, they would have felt no further moral qualms about using mustard gas on Iwo Jima, or even against the Japanese home islands. The potentially most effective biological weapon developed by the Japanese was the Uji Type 50 bomb, which had a ceramic case and celluloid fins meant to burn without leaving telltale traces. The bomb was equipped with a time fuse to detonate the bomb at the best altitude for maximum dispersion of the agent. Between 1100 and 2500 Utji bombs were produced from 1938 to 1945. Another bomb was the Ha bomb, a fragmentation bomb enhanced with anthrax to infect the wounds inflicted by the bomb. No records were left after the war to indicate whether any of these bombs saw operational use. Nakano graduates were trained to use a device resembling a fountain pen, but containing pathogens to be released into enemy wells. Again, no record survives of its actual operational use. Goldstein and Dillon give a translation of the diary of Rear Admiral Nakahara Giichi, who held a high staff position in the Navy Ministry at the time of Pearl Harbor. The diary entry for 9 October 1941 mentions a meeting of bureau chiefs in which one of the topics is "Manchuria -- Microbe fighting." It seems likely that a better translation would be "germ warfare" and that the senior officers of the Japanese Navy were aware of the Army's experiments in Manchuria, though there is nothing to indicate how detailed the Navy's information was. Germany, Britain and the United States are all known to have engaged in biological warfare research, probably with an eye to deterring use of biological agents by their enemies. British research on anthrax resulted in the contamination of the small island of Gruinard in Scotland, which remained quarantined until 1990. However, the only instance of biological warfare in Europe was the deliberate flooding of marshes behind the Anzio beachhead in Italy by the Germans to encourage proliferation of malaria-bearing mosquitoes. There was no known use of biological agents by the Allies in either the Pacific or Europe. The industrialized powers of the Pacific War relied primarily on the threat of retaliation to deter their enemies from using chemical agents, but they also took measures to defend their troops against chemical attacks. The principal defenses against chemical attack were gas masks, protective clothing, and decontamination. FM 21-40. Via ibiblio.org. Click to enlarge. Gas masks were rubber face masks that could be adjusted to produce an airtight seal around the mouth, nose, and eyes. Air could enter the mask only after passing through a canister that filtered the air of chemical agents. Air passing through the canister flowed through a mechanical filter, then passed through powdered alkali and activated charcoal. The mechanical filter removed particulates such as smoke from white phosphorus. Activated charcoal is almost pure carbon with a huge surface area at the molecular level. Almost any sizable molecule encountering this surface will be held there (a process called adsorption) and this makes activated charcoal a highly effective nonspecific filtering agent. The mechanical filter blocked particulates, such as smoke, while the alkali helped keep the activated charcoal dry and neutralized certain chemical agents, such as phosgene and hydrogen cyanide, whose molecules were too small to be effectively absorbed by the activated charcoal. Visibility was provided by a pair of glass or hard plastic lenses. However, to ensure these would have sufficient strength, they had to be made relatively small, which hindered vision. Thus troops who were masked against chemical attack lost some combat efficiency. 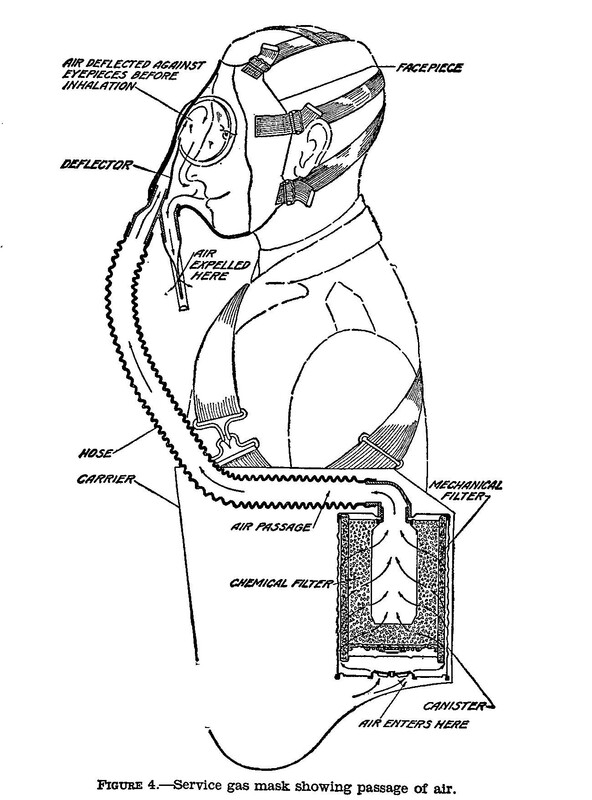 Well-designed masks ensured that air entering the mask first passed over the lenses to reduce condensation. 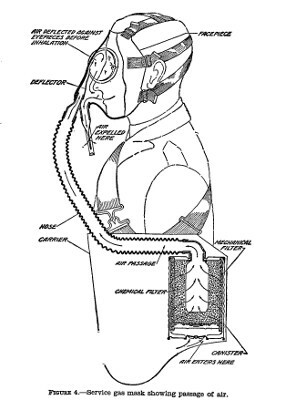 Gas masks were adequate protection against many chemical agents, but not against the mustard or nerve gases. Because these agents could be absorbed through the skin, troops attacked with nerve or mustard gas required protective clothing as well, which further degraded combat effectiveness. Chemical-resistant cloth tended to be heavy and stiff, making it particularly uncomfortable in jungle fighting. Decontamination was the neutralization of persistent chemical agents that had contaminated persons, equipment, or ground. Mild oxidizing agents, such as calcium chlorate (also used to purify water), could oxidize mustard and nerve agents and thus render them harmless. The difficulty here is that oxidizing agents were corrosive and could damage equipment. Preparation for defense against chemical attack including training of troops in the use of gas masks and protective clothing. This may have served a dual purpose. The U.S. Army training manual for chemical defense, FM 22-40, is remarkably thorough in describing the most effective use of chemical agents in combat, though this is always phrased in terms of anticipating and preparing for chemical defense. However, the fact that chemical agents saw little or no use in combat between the Axis and the western Allies seems to have bred a certain amount of complacence, and first-person accounts rarely mention gas masks or other chemical defenses. If American troops had been subject to a sudden massive chemical attack, they would likely have been caught unprepared and suffered high casualties, but fortunately the Japanese refrained from attacking American troops with gas, probably out of quite justified fear of massive retaliation.